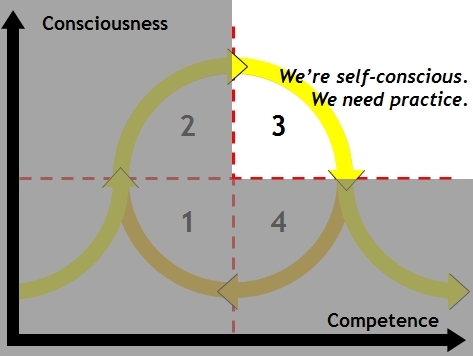 Last year I wrote about the Conscious Competence model, first formulated by Martin Broadwell [PDF] in 1969. I find it very helpful when thinking about developing new skills in any type of experiential learning or professional development process, and yesterday I had the chance to use it in an exercise with some of my MBA students at Stanford. 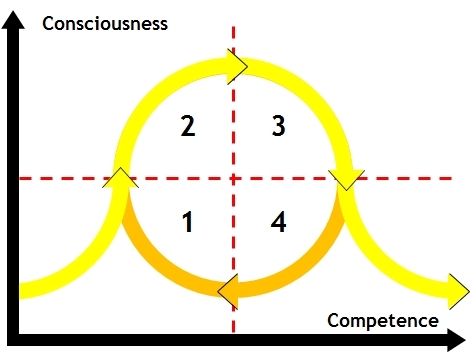 The model suggests that we typically cycle through four different phases as A) our competence in a given discipline and B) our consciousness (i.e. our in-the-moment self-awareness) change over time. When we start out in any discipline we're Unconsciously Incompetent. We don't know what we're doing, and we don't know what we don't know. We're making mistakes, and we're unaware of those mistakes and their impact on us and others. This lack of awareness isn't always a permanent condition. At times when we're compelled to step back and take stock, we may realize the scope of the problem from that new vantage point. But we lose perspective the moment we take action again, and, unaware, we repeat the same mistakes. Put simply, in Phase 1 we're blind, and we need feedback. 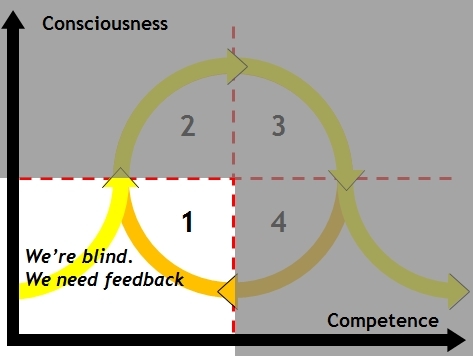 When we have the opportunity to get useful feedback, our awareness tends to outpace our skills, and we become Consciously Incompetent. We still don't truly know what we're doing, but now at least we realize this. We're making mistakes, and we see their impact. 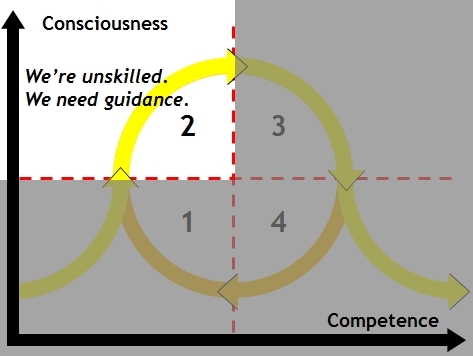 So in Phase 2 we're unskilled, and we need guidance. When we get the guidance we need, we skill up and become Consciously Competent. We're not perfect, but we're making fewer mistakes, and we're generally achieving our goals and desired outcomes. But at this stage the process still requires a significant amount of deliberate effort and forethought, which is tiring and limits our capacity. So in Phase 3 we're self-conscious, and we need practice. With repetition we eventually relax, and the process becomes more automatic, less deliberate.This doesn't mean that we lose all awareness of our abilities, but when engaged in an activity we don't need to focus intensely on our goal to hit the mark. Optimally our skills are balanced with the challenge at hand and we achieve what psychologist Mihaly Csikszentmihalyi (pronounced Cheek-sent-me-high) has called a flow state, in which we become fully absorbed in our task and may even lose track of time. But as Csikszentmihalyi also points out, when our skills increase relative to the challenge we face, inevitably we drift out of that engrossment and become bored. So finally, in Phase 4 we're in the flow, and we need new challenges. 1. Consider a meaningful and complex effort that you're involved in. For example, "Be a better leader," or "Communicate with my team more effectively." 2. Identify specific practices or disciplines that comprise this process, and determine where you'd locate yourself with regard to each one in the model. Be sure to identify at least one practice or discipline in each quadrant. Where do I need feedback? Where do I need guidance? Where do I need a new challenge? Yesterday I put this model on the whiteboard and discussed it with my Stanford students--in this case a group of Leadership Fellows who spent Fall Quarter guiding groups of First Year students through our Leadership Labs course and who've been providing one-on-one coaching to additional First Years since mid-November. 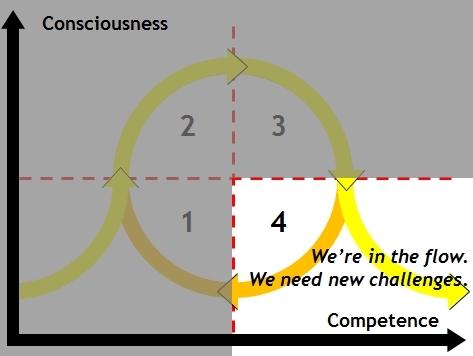 I had them spend a few minutes reflecting on their experience as Leadership Fellows and on their professional development process more generally, and to identity one specific practice or discipline that would fall into each quadrant. Then I asked them to write those practices on the board, which prompted a thoughtful discussion about our respective areas of competence and incompetence, unconsciousness and self-consciousness. I experience anger pretty rarely--I get annoyed as often as anyone, but full-on anger is very unusual. As a consequence, it can catch me by surprise, and I sometimes find myself over-reacting and upsetting people before I'm even aware that it's happened. So it's a priority for me to get feedback on when I'm giving off any signals that might suggest that I'm angry, so I can better attune myself to what's going on. Issues related to diversity and social identity more broadly are important to me, for professional and personal reasons. At the very least I need to be able to work effectively as a coach with a wide range of people. So I've made a meaningful effort in recent years to step more fully into conversations about diversity. I've made plenty of mistakes along the way, but I've benefited from a lot of helpful support, and I'm determined to keep trying. Empathy is critically important in my work as a coach. My students and clients need to know that I truly understand and share their feelings, particularly those that involve any form of embarrassment or shame in the face of a struggle. At the same time, my reflexive response to others' challenges often takes the form of problem-solving or advice, which can be helpful in certain circumstances but often blocks the full expression and reception of empathy. Feedback from my students and clients suggest that I'm effective at conveying empathy, and yet I know it requires some degree of conscious effort to avoid unhelpful responses. Perhaps the most essential role I play as a coach is providing a balance of support and challenge, and I have to be able to provide both in every relationship (and optimally in every single interaction.) If a student or client feels that I'm a comforting source of support but haven't really challenged them, we're leaving important learning on the table. And if they feel that I offer a bracing challenge but are unsure of my support, they'll be unlikely to trust me fully. I've worked on this discipline for many years, and at this point it feels like second nature to me--it's simply how I am as a coach.